I believe independent and freelance writers can build a successful career—and that includes financial success. But, there are several things you have to do and believe first. First and foremost, you are a business, not “just” a freelancer . 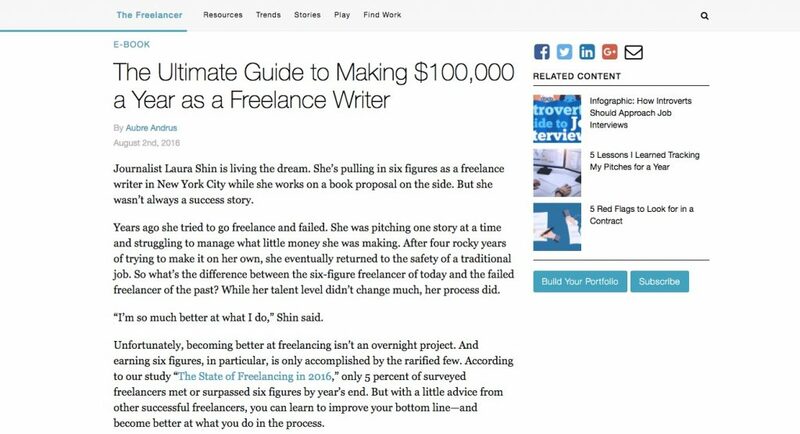 I had the amazing opportunity to provide other writers tips on building a successful freelance business for the ebook, “The Ultimate Guide to Making $100,000 a Year as a Freelance Writer,” which has now been published by Contently. It’s free (although Contently requires a one-time registration) and is chock full of helpful advice from other freelancers (business owners!). Some of my advice? Shift to a business mindset. As I say in the book: “[Running a business] is the ability to constantly think about what you can offer people, what you like to do, how you can monetize what you like to do.” I also talk about the power of networking, which is a must—both online and in-person—for building a successful business. But I’m not the only one in the book; several other freelancers offer award-winning advice that you will benefit from. Thanks to writer Aubre Andrus and Contently for including me in this great book.